Prositions Releases New Master Learning Series of Micro-Learning Courses Based on Best-Selling Books | Prositions, Inc. Prositions Releases New Master Learning Series of Micro-Learning Courses Based on Best-Selling Books | Prositions, Inc.
Prositions, Inc., a leading training content producer and distributor, has released a new subscription-based collection of courses: the Master Learning Series. Each course summarizes the key concepts from a best-selling business book and presents them in a micro-learning format. With fast-paced scripts, visual animation, and high-definition video, the courses were carefully produced to deliver bite-sized chunks of information to employees in an engaging format. The Master Learning Series comes complete with an administrator’s guide to help training managers successfully launch and promote the courses internally. It includes email templates, suggested rollout calendars, and reinforcement materials for each course. To ensure that training is always new and fresh, subscribers receive additional courses as they are released (at no additional cost). In addition, subscribers are invited to attend exclusive webinars with the authors and subject matter experts for a chance to meet and interact with them. 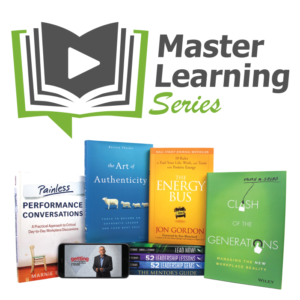 For more information and to preview each of the courses in the Master Learning Series visit https://www.masterlearningseries.com or call (515) 864-7200.